YOU ARE NEW TO THIS. Personas are stereotypes of certain stakeholder groups. They help to empathize with otherwise abstract descriptions of e.g. customer groups. We identified two main groups of people who visit www.tisdt.com. Those who want to learn more about the book and those who already have it and want to work with some of our auxiliary offerings. The start screen helps to guide them through our website. Through observations and contextual interviews we analyzed the information processing of people interested in the book. Based on these user needs we structured the information and its quantity. So users are guided from a very brief info on the book to finally where to get it. Users who own a book already or at least know what it is about, are predominantly interested in downloading the customer journey canvas or the icons. Did we say that we are also working on a software tool which will make the process of designing service systems quicker and easier? Register now to be among the first to know when we release our beta version. We take the “line of interaction” seriously. Well, not quite. However, beneath it we provide an overview on what other people say about TiSDT in the most important social media. Underneath you can find mistakes we discovered in the book and our contact details. As this information doesn't refer to a specific user group, it is in an area accessible from every part of the website. The UserVoice feedback system is a great way to provide feedback, ideas on how to improve the experience and critics what's wrong. This book outlines a contemporary approach for service innovation. 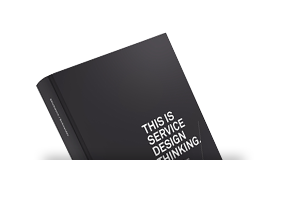 »This is Service Design Thinking.« introduces a new way of thinking to beginners but also serves as a reference for professionals. It explains the approach, its background, process, methods and tools — and connects theory to contemporary case studies. A set of 23 international authors created this interdisciplinary textbook applying exactly the same user-centered and co-creative approach it preaches. 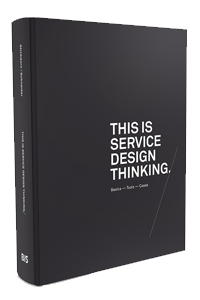 »Marc and Jakob have not only applied their well-considered method to study and describe the elements of Service Design; they have also used it in designing the book, making it a piece of meta-design. Owner and Strategic Design Director at DesignThinkers, a strategic design agency based in Amsterdam, the Netherlands, that specializes in New Marketing and Branding, Social Innovation, Service Design and Customer-Centred Design. Chairman of the Service Design Network Netherlands. Founder of the WENOVSKI Design Thinkers Network. Founder of the Healthcare Initiative CareToDesign. Arne is guest lecturer at Management Centre Innsbruck Austria, and has given lectures at Savonia University of Applied Science in Finland, Parsons New School New York, Delft University of Technology, Rotterdam University of Applied Science, and various other international institutions. Asier Perez (born 1970) graduated in 1996 with an MFA from the École Régionale des Beaux-Arts de Nantes, France. Unhappy with the inefficiency of arts for social transformation, he decided to move into business after ten years of a successful career in arts. Asier Perez founded Funky Projects in 2002, after some other ventures, to stir-up innovation in organisations that aim to change themselves and their environment. Asier is a regular speaker, visiting teacher and media contributor in several European countries. He was teacher at the Fine Arts College of the University of the Basque Country from 1997 to 2001. Bas Raijmakers holds a PhD in Design Interactions from the Royal College of Art and runs his own design research company STBY (Standby) in London and Amsterdam with Dr. Geke van Dijk. Bas has a background in cultural studies, the internet industry, and interaction design. His main passion is to bring people into design and innovation processes, using visual storytelling in general and documentary film techniques in particular. He is the founder of the international Global Design Research Network ‘Reach’ and also teaches and researches at Design Academy Eindhoven. Beatriz Belmonte is an information management and communication specialist. Her background includes History of Art, Museology, Information Management and Business Intelligence in different universities of Madrid and Barcelona. She has been involved in the design of e-learning and corporate communication projects, and since 2007 she has run her own site about communication and new technologies. Since 2008 she works at Funky Projects as web and knowledge researcher looking for new ways to turn information into knowledge to trigger transformation. Erik Widmark graduated 2006 as a MFA from the Konstfack, University College of Arts, Crafts and Design in Stockholm, Sweden. Puzzled that everything in design school revolved around design being a handicraft (modelling, sketching etc. ), Erik and three classmates explored the area of design thinking as their master project. With no one wanting to employ radical design thinkers, Erik and his colleagues had no option but to start their own business. Since 2007 Erik has been working as a design strategist and service designer at Transformator Design Group, which has pioneered in the area of service design in Sweden. Fabian holds an MSc in Design and a BSc in Cognitive Science, both from Linköping University. He is currently doing his PhD, in which he focuses on user involvement in the early stages of service design projects. He has published on visualisations in service design as well as appropriations of ethnography to service design and interaction design. When not in office, he enjoys doing various sports and travelling to remote corners of the world, often to go diving there. At the time of writing, Fergus is a Research Assistant in the Human Centred Design Institute in the School of Engineering and Design at Brunel University in West London, UK. He is developing a public engagement exhibition with The Design Museum, London, entitled ‘Ergonomics - Real Design‘. A social media enthusiast, Fergus is also an Associate with FutureGov Consultancy and Destinable. When not wearing his design hat, Fergus can be found wearing his ski hat or running shoes. Geke van Dijk is co-founder and Strategy Director of STBY (Standby) in London and Amsterdam. STBY is specialised in design research for service innovation, and works for clients in industry and the public sector. Geke has a background in ethnographic research, user-centred design and services marketing. She holds a PhD in Computer Sciences from the Open University in the UK. Geke is the initiator and co-founder of Service Design Network Netherlands, and publishes regularly about Service Design and Design Research. Jakob is partner at a design agency in Cologne. He graduated with a diploma in Communication Design, with Distinction, from the University of Applied Sciences in Münster, Germany. Being a freelance design consultant and graphic designer since 2006, he has worked with a wide range of various clients, from small cultural institutions to nationally operating trading companies. In his professional work he strives not to separate branding from information design. Jakob also spent some time at MetaDesign, Berlin. Right now he is working on digital service design tools together with Marc Stickdorn and Klaus Schwarzenberger. Jamin Hegeman is an interaction and service designer at Adaptive Path. He previously spent time at Nokia, Yum Yum Web, University of Pittsburgh, EEI Communications, and United Press International. He has a master’s degree in design with a focus on interaction design from Carnegie Mellon University, and a bachelor of arts in English writing, with a concentration in poetry, from the University of Pittsburgh. Jamin has been actively engaged in promoting and supported the Service Design Network since 2008. He taught interaction design at Carnegie Mellon University, and has spoken at various international conferences. After about ten years working in care for the elderly and people with dementia, I became interested in human behaviour and took a bachelors degree in cognitive science. From there I went on to a master in design, eager to apply my newly acquired knowledge about humans as social, communicative, and embodied beings situated in cultural and evolutionary contexts. During this time I also started working with user innovation and managing projects where design students collaborated with organisations and companies. My current research, as a PhD student at Linköping University, is aimed at expanding our knowledge about prototyping services. Kate Andrews is a writer, designer and social communications consultant. She has a BA First Class Honours in Graphic Design, a Merit Award from the International Society of Typographic Designers, and is a Fellow of The Royal Society of Arts. On themes related to design’s social impact, Kate has contributed to many design platforms, including Change Observer, Inhabitat.com, Eye Magazine and Design21sdn.com, and has lectured to design students in the UK and in Oslo. Her freelance clients include: Mencap, Visual Editions, The Affluenza Exhibition, Thinkpublic, Colalife, The New Economics Foundation and Project H Design. Kate Blackmon is currently AIM ESRC Mid-Career Fellow in Services at the University of Oxford, where she is a Lecturer in Operations Management at the Said Business School and a Tutorial Fellow in Management Studies at Merton College. Trained as a Chemical Engineer, she has worked in a variety of public and private services during her career. Her current research focuses on service innovation, in sectors including health, culture, education, and the digital economy. With an enthusiasm for service design, public services and working with people, Lauren focuses on changing the lives of British people through service design and practical action. She mentors and teaches undergraduate students at universities all over Europe, running a variety of workshops and lectures on Service Design, Prototyping and Critical Thinking. As the Director of MyPolice, Lauren is working closely with the police and the public to ensure the police service is the very best it can be. In addition, Lauren is an associate of the mental wellbeing movement Mindapples, Sociability and Thriving.org. Lucy Kimbell has taught an MBA elective on design management at Saïd Business School, University of Oxford, since 2005. She was principal investigator on a multidisciplinary research project on the design of services in science and technology-based enterprises involving academics from management and design; IDEO, live|work and Radarstation; and science entrepreneurs. Her main interest is establishing what is distinctive about a ‘designerly’ approach to service design. Lucy originally studied engineering design, later did an MA in digital arts, and is completing doctoral work in design theory. Luke Kelly graduated from the University of Liverpool in 2007, obtaining a masters degree in Politics and the Mass Media. After working as a researcher for a UK politician, he spent a year living in Shanghai whilst lecturing at Xian-Jiaotong Liverpool University, before travelling to Amsterdam to work with STBY. Now based in STBY's London office, Luke's main interests concern the effect technology exerts on culture. He's currently using the ethnographic experience gained from working within service design to write a PhD proposal examining the impact of techno-cultural media on the Japanese public sphere. Marc Stickdorn graduated in Strategic Management and Marketing and worked in various tourism projects throughout Europe. Since 2008 Marc is full-time staff at the MCI – Management Center Innsbruck in Austria, where he lectures service design and innovation. His research involves the development of the mobile ethnography app myServiceFellow, the Customer Journey Canvas and various publications and presentations. Marc is co-founder of Destinable, associate of DesignThinkers, guest lecturer at various international universities and occasionally speaks at conferences. Ralf Beuker holds a diploma in Business Administration from the University of Paderborn, Germany; besides his business projects he is a Professor for Design Management and Dean of the Design School at the University of Applied Sciences in Münster, Germany. Ralf’s professional background is based on the areas of strategy consultancy, design management research and understanding technological innovation. Ralf teaches at all leading design management programmes in Europe, and since 1998 runs www.design-management.de, the first blog worldwide dedicated to the field of ‘Design, Management and Business Issues around design management’. Renato Troncon is Professor of Aesthetics and Coordinator of the Centre for Aesthetics in Practice at the University of Trento. He is author and/or editor of about fifteen books and fifty scientific articles, presenter of more than fifty lectures at scientific congresses, scientific coordinator and organizer of more than thirty scientific national and international meetings as well as member of various scientific academies and networks for anthropological philosophy, design, cultural policies. His researching/ teaching is devoted both to philosophy and to design research and practice. Sarah Drummond focuses on making social change happen by rethinking public services from a human perspective. She is leading a process of change, putting design thinking at the heart of their organisation, and building capabilities of staff to innovate from the ground up. Her work challenges the role of design within the public sector. As the winner of the first Scottish Social Innovation camp, Sarah ambitiously challenges the way governments operate and make policies through initiatives such as MyPolice. Sarah teaches at various international universities. Dr. Satu Miettinen is professor of Applied Art and Design at the University of Lapland in Rovaniemi, Finland. Previously Satu worked as a co-ordinator for the Competence Center of Industrial Design at the Savonia University of Applied Sciences. For several years she has been working with service design, leading various service design projects funded by the Finnish Funding Agency for Innovation and Technology, TEKES. In the past she has worked as a project manager and specialist in the areas of craft development, cultural and creative tourism in several international and European Union funded projects during the period 1997–2006. Simon is professor of Interaction Design at the Oslo School of Architecture and Design. He has been teaching service design for over four years, and is about to complete a major service design research project called AT-ONE. In an earlier life he has managed a large brand and design department at a Scandinavian consultancy, has been research manager at Telenor and has had his own consultancy. He is passionately enthusiastic about the strategic role of design in organisations, and how designers add value to cross-functional development teams. When not designing, he admires the design of old sports cars, which he can't stop collecting (and repairing). Stefan Holmlid is assistant professor in interaction and service design at Linköping University, with fifteen years of experience in design research in academic as well as industrial settings. He pioneered studio teaching of interaction design and service design in Sweden, and continues to teach user-driven innovation, interaction design and service design. Currently his research interests are the expressive powers of and the involvement of stakeholders through design methods and techniques in service development and service innovation. The book comes with hardcover, 376 pages, 149 photos, 41 illustrations, 23 authors, three coloured bookmarks, Customer Journey Canvas poster and many visual aides to deliver an improved reading and learning experience. This website is about a book that deals with services. Therefore, the book and in fact this site are services themselves. Get informed about the project. We are pleased to welcome you to the post-service period of the book. Stay connected with authors and readers and make use of the free tools provided. The Canvas has been developed to support you when designing services. You can use it not only for yourself to get a quick overview of certain service processes, but also with providers for a self—portrayal and with customers and other stakeholders to explore and evaluate services. It is available under cc license. Try it, adapt it, take a snapshot and share how you use the canvas through Facebook or Twitter below. Do you like the visual language of the book? Do you imagine the graphics could be useful for visualizing your own projects? No problem, just download all of them right here. It's free. All graphics are published under CC license. smaply is a web-based software solution to visualize Personas, Stakeholder Maps, and Customer Journey Maps including Storyboards, Emotional Journeys, Dramatic Arcs, and many more. With smaply you can digitize, store and share your workshop results in a simple and quick way. We also provide an open list of qualified experts and agencies to expand your network. Learn the basics in a vibrant and hands-on workshop setting. Together with Markus and Adam (WorkPlayExperience and instigators of the Global Service Jam), Marc offers 5-day executive schools. If you want to learn how to facilitate service design workshops and plan your own service design project. BOOK EXPERIENCED KEYNOTE SPEAKERS OR WORKSHOP FACILITATORS. Make use of a powerful tool for professional deliverables. smaply is a web-based software solution to visualize Personas, Stakeholder Maps, and Customer Journey Maps. With smaply you can digitize, store and share your workshop results in a simple and fast way. You can test it 14 days for free. Collect real customer experiences in a digital environment. ExperienceFellow enables customers to document their experiences with a super-easy smartphone app. You can then view and analyze their data with our powerful web-based software. 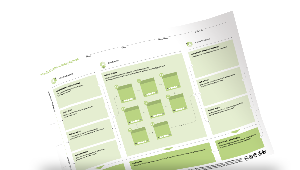 mr. thinkr offers workshop-ready materials to make your daily service design work easier. After workshops we often got asked where we bought our workshops materials. We made it ourselves or got it from various shops around the world. To make life easier, we now collect and offer cool stuff in our small online shop. This is mr. thinkr. to continously develop this list. All content on our website is assembled and tested carefully. A liability or guarantee of accuracy, completeness and timeliness will be declined. This also applies for all other hyperlinked sites. We are not responsible for the content of hyperlinked websites. We preserve the right to update, change or add information or data. The structure and all content of this website is copyrighted by Jakob Schneider & Marc Stickdorn. Reproduction of information or data, especially the use of text, pictures or programming code in external documents or websites requires our affirmation.